The entry of the word "tattoo" or wen shen ("to pattern the body") into the written history of China extends back to the Han Dynasty (206 B.C. -220 A.D.). Although there are several other terms associated with the practice of tattooing like mo ("to ink"), lou shen ("to engrave the body"), xiu mian ("to embroider the face") among others, it is widely accepted that wen shen is the most appropriate historical term for two reasons. Why you may ask? Because the word is used more frequently than the others in ancient texts, and more importantly the character meaning "to pattern" is believed to symbolize an anthropomorph or individual with a tattooed chest. Regardless of these associations, in antiquity tattoo was typically associated by the ruling Han elite as a "barbaric" practice reserved for ethnic minorities and other "foreigners". The Han considered themselves to be the only "real" Chinese people and all others as man or yi - tribal "primitives" who cut, scarred, or tattooed their skins with permanent marks. In other words, if you were not Han, you were "uncivilized" and perhaps even considered to be an "enemy" of the state like the inhabitants of Wo in Japan who in the third century A.D. were said to "tattoo their faces and bodies." "If a lord is aggressive and wants to rise in power, he will be forced to employ his own people. Then the people will love me, instead, with the love of parents. They will find my scent like that of the iris and epidendrum. 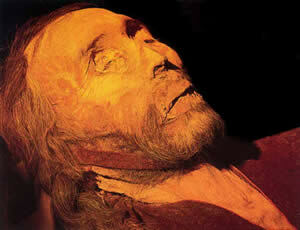 They will turn from their lord and look upon him as if he were tattooed, as if he were their sworn enemy." Later texts clearly state that the only form of tattoo acceptable in Chinese society is that reserved as punishment for robbery, adultery and other grave offenses. In fact, the sixth-seventh century A.D. text Han shu ("Treatise on Punishment") relates that there were five-hundred crimes punishable by tattoo. The term used in that text is mo zui ("ink crimes") and tattoo was often combined with exile, "ensuring that the defiled person was removed as far as possible from law-abiding, civilized people." The religious beliefs of the time also dictated that tattooing was immoral and negative. This is because popular Confucian principles generally discouraged any kind of permanent body modification since filial conduct maintained that one's body should remain as it was given to them by their parents. Some scholars have also suggested that the Buddhist idea of reincarnation may have also contributed to the tradition of keeping the body pure. These negative connotations continued down through the centuries, and with the establishment of the People's Republic of China in 1949 the Communist government implemented policies of pochu mixin ("eradicating superstitions") and yifengyisu ("changing prevailing customs and transforming social traditions"). These laws were aimed at China's fifty-six ethnic minority groups and ultimately led to the demise of tattooing amongst those peoples who practiced the indelible art including the Li of Hainan Island and the Dulong of Yunnan. But this overview of tattooing in tribal China is not only about official views regarding the indelible art. Rather, it offers an exploration into the cultural history of tattooing among the Li, Dulong, and other "tattooed outsiders". Of course, this discussion would not be complete if it did not include the aboriginal tattooing practices of the inhabitants of Taiwan who entered into the popular imagination of Chinese chroniclers as early as the seventh century A.D. As an "uncultured" people who "tattooed their bodies with snakes and insects," the peoples of Taiwan shed light on many aspects of tattooing that have not been documented for other groups that also resided outside of the "official realm." Unfortunately, however, the practice of tattoo in Taiwan is now extinct in its traditional (hand-tapped) form. And within another generation tattooing will also disappear amongst the last generation of elderly tattoo bearers in the Chinese hinterlands. Since the late 1970s, hundreds of Caucasian mummies have been discovered in northwest China and some bear evidence of a highly evolved tattoo culture. Before the advent of written records in China, groups of these traders penetrated the far western frontiers of the country as early as 5500 years ago on horseback. Although their origins have been obscured by time, recent DNA evidence suggests that these intrepid travelers where from South, Central, and West Asia. Meticulous studies of their clothing have revealed links to the Caucasus and Europe and it is believed that their language was of the Indo-European family. It is also quite probable that these Westerners brought the chariot, the wheel, bronze metallurgy, and perhaps even writing, surgical techniques, and knowledge of medicinal practices akin to acupuncture. From the standpoint of their tattooing, however, we know very little outside of the intricate designs adorning many of their desiccated bodies. This is partly due to lack of access to the tattooed mummies, lack of documentation in the press and scientific community, and perhaps even disinterest in the ancient custom itself. What is known is that some of earliest tattoos date to the second millennium B.C. and depict solar motifs. Not surprisingly, similar heliolatrous designs have been found at rock art sites across Central and South Asia, and also on the horse bridles of the Caucasian tribesmen who probably worshipped the sun. These motifs also appear on the famous 3800-year-old Cherchen man applied as body paint after he died. Cherchen Man as he is called stood 6'6 inches tall. Red-haired, long-nosed, and with deeply set eyes, his physical appearance matches ancient Chinese texts describing "legendary" figures of great height, with deep-blue or green eyes, sharp facial features, full beards, and red or blonde hair. A painted solar symbol adorns his temple and may have served to carry him into the afterlife through ritual means of purification. Interestingly, one 3500-year-old blonde female mummy is adorned with an incredibly intricate latticework of tattoos on the back of her hand that some scholars believe is a form of text. Shaped like a series of backward "S's " juxtaposed with other alphabetiform symbols, this indelible calligraphy resembles ancient Chinese characters. She is also tattooed on her forehead with a series of circular designs. 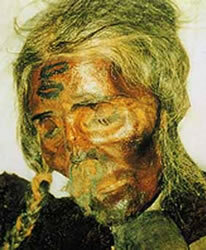 3500-year-old Caucasian woman with tattooed forehead, hand and long braids. Writing in the first century B.C., the Chinese chronicler Wang Bao alludes to the Caucasian invaders as a people "who braid their hair, scar their faces, blacken their teeth, and whose eyes are set deep. There are also those that tattoo their heads." Taken together, all of the above findings shed negative light on many Chinese claims to history. And if it is true that these western "barbarians," or peoples who lived beyond the boundaries of "civilization," brought such technological advancements to China first, then that would change the course of world history as we know it. As Chinese linguist Dr. Victor Mair has noted, "For all their incredible inventiveness, the ancient Chinese weren't cut off from the rest of the world, and influences didn't just flow one way, from China westward." 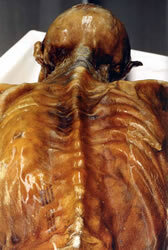 Do ancient Caucasian mummies from China bear therapeutic tattoos like those worn by the Iceman? Tattooed bracelets and other markings placed at specific points of the body have been documented for both sexes, but we are still waiting for answers. Simulation of Li hand-tapping among the Meifu tribe, ca. 1988. The Chinese call Hainan "The Tail of the Dragon," a wild place at the end of the world that at one time or another was considered more remote and mysterious than either Tibet or Mongolia. Along the southeastern coast of China there lie two great islands, Hainan and Taiwan. For thousands of years they were regarded as the two "eyes" of China safeguarding the peace and order of the Middle Kingdom from threats by pirates and invaders from the high seas. As a consequence of the Sino-Japanese War which ended in 1895, one of the eyes - Taiwan or Formosa as it was formerly called - became blind and was subsequently ceded to Japan as the price for peace. This left only Hainan at the Tail of the Chinese Dragon. Hainan has been populated by the Li people for over three-thousand years. And for centuries the Li were regarded by Chinese scholars as the "tattooed" or "scarified race" of the south who knew no civilization. Indeed, they shared with other "primitive" tribes in southwestern China like the Miao, Yao, Lolo, and Shan the title of "Southern Barbarians." Perhaps that is why one of the Chinese characters for the Li translates to "black" due to their custom of tattoo.